Wisconsin is the fifth best overall state for millennials, according to a new study from Wallethub.com. Loved by marketers yet vilified by media, millennials are at once the most popular and unpopular generation alive. They’re projected to become the largest in 2019, too, giving them a huge influence on American culture and consumption. Today, these early-20-to-early-30-somethings who are often depicted through negative stereotypes—entitled, parentally dependent, emotionally fragile—are responsible for 21 percent of all consumer discretionary spending in the U.S. Yet despite millennials’ trillion-dollar purchasing power and higher educational attainment, they are economically worse off than their parents. Why? The financial crisis remains a big part of the reason. Millennials have come of age and entered the workforce in the shadow of the Great Recession, which has significantly reduced their job prospects and earning potential for decades to come. By one estimate, millennials today earn 20 percent less than Baby Boomers did at the same age. But the millennial experience is not the same everywhere. WalletHub compared the 50 states and the District of Columbia to determine where this generational has thrived and struggled. We examined each state and the District across 36 key metrics, ranging from the share of millennials to millennial unemployment rate to millennial voter-turnout rate. 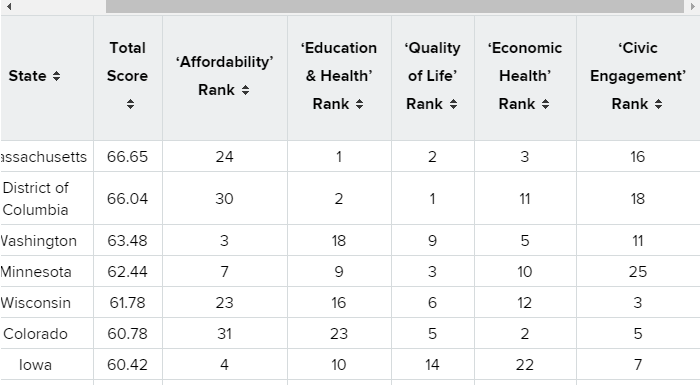 In individual categories, Wisconsin ranked 23rd in affordability, 16th in education and health, sixth in quality of life, 12th in economic health, and third in civic engagement (based of 2016 voter turnout). To see the methodology and read the entire study, click here.